Sydney: a relaxing day ending up in a dinner cruise on Sydney Harbour! Here are a few reasons you’ll want to leave Sydney. The crowd, the traffic and everything is overpriced. And it’s HOT! Very hot. I know I know, we’ve all, at some point, dreamt of living in cities like Sydney and its likes. There’s something so irresistible about the tachycardic pulse of a fast-paced society that never seems to rest. Which isn’t all good. But sometimes, this frenzied addiction for living life in the fast lane calls for the occasional breather. Strictly doctors’ orders! Much like a handwritten letter or handmade card means so much more than an e-mail or whatsapp message these days, a day-long escapade to old-world charm awaits. A morning well-spent on a beach, leisurely walks through the Rocks precinct to a dinner cruise along Sydney Harbour, we’ve got the low-down on what a well-deserved break/ ideal weekend in Sydney could be like! Start the day off with sand, sunscreen and good ol’ Vitamin Sea! Head on over to one of the 100+ beaches in Sydney to cool off (ironically). There’s just something about clear sunny skies, the sound of the waves kissing the shore and the sound of happiness resonating all around. If you’d like, pack a picnic or indulge in a boozy brunch in one of the many beachside eateries. Beaches, while relaxing, are exhausting and need a shower and nap (a second one, in case you’ve already done so at the beach) to recover from! Change into something more comfortable and head on over to the Rocks! The Rocks precinct is Sydney’s page right out of a history textbook. Wander down secret alleyways, cobbled lanes leading you into tree-lined courtyards. You could opt for a walking tour to comprehensively orient yourself with the heritage of their area with friendly enthusiastic guides. Get that appetite running for the dinner plan that awaits. 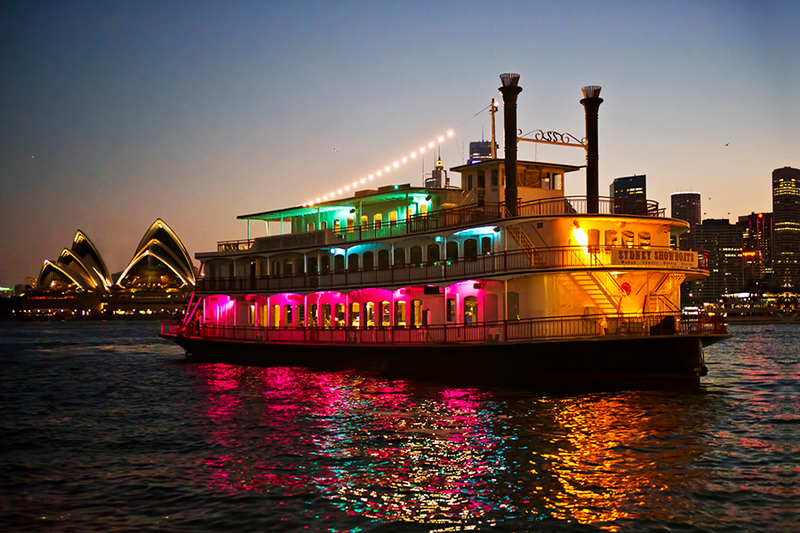 With 32 years of cruising experience, this 3-course Sydney Harbour dinner cruise on an authentic paddlewheeler and a show, is Sydney’s crown jewel. What a way to top off the night! Wear your Sunday finest and get ready to be transported back in time, for an evening one can only dream of. You’re welcomed into the boat by the beguiling Australian showgirls and escorted to your reserved tables where entrees are served. Stroll the expansive outer decks, drink in hand, soaking the incredible harbour views of the Sydney Opera House and Harbour Bridge. As you enjoy your delectable meal, also enjoy the spectacular cabaret show that unfolds before your eyes. The talented cast of all-Australian dancers and singers take centre stage to put up a fabulous show that’ll get your feet tapping, hands applauding and face smiling! If that wasn’t a day of fabulous old-world charm and fun, then I don’t know what is. Sydney may have its quirks, but it has enough to get you falling in love all over again. Locals and tourists love the city and why not? With an incredible skyline, being home to the world’s most beautiful harbour, where the food is always good and the beer is always cold. Sigh, Sydney you have my heart! So let me rephrase what I started off with. These were a few reasons you’ll want to leave Sydney.. but there are a lot more why you’d want to come back ASAP!